We intend to deliver more efficient, sustainable and cost-effective energy storage devices to power things we use every day – including automobiles. We aim to achieve this by advancing research and developing and commercializing energy storage technologies, including lithium-ion batteries. 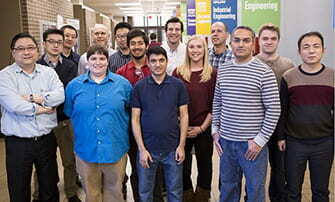 Led by Professor Deyang Qu, the Johnson Controls Endowed Professor in Energy Storage Research, the lab is a collaborative, joint appointment between UW-Milwaukee, the Wisconsin Energy Institute (WEI) at UW-Madison and Johnson Controls, a global leader in the manufacturing and distribution of batteries. This is an industry-academic partnership between Johnson Controls and two of the state’s largest public tier-one research universities. These state-of-the-art labs, built by Johnson Controls, include Wisconsin’s only dry lab for energy storage research in an academic facility. 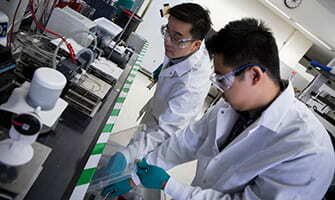 In the Energy Storage Research Lab the focus is on fundamental electrochemical research, seeking new materials and understanding reaction mechanisms in the areas of renewable energy, sensor and water treatment. The applied development taking place in the Energy Storage Research Lab links academic research with industrial product innovation to develop a new generation of energy products with longer and stronger storage abilities, increasing our energy security and improving our environment by reducing the amount of carbon dioxide emitted into the atmosphere.